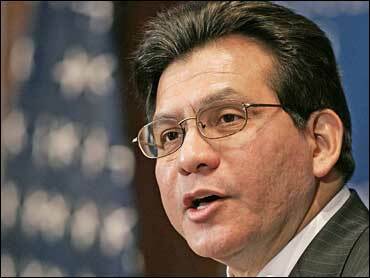 In a speech June 1 to announce the bill, Attorney General Alberto Gonzales urged Congress to re-impose mandatory minimum prison sentences against federal convicts — and not let judges consider such penalties "merely a suggestion." Such an overhaul, in part, "will strengthen our hand in fighting criminals who threaten the safety and security of all Americans," Gonzales said in the speech, delivered three days before the FBI announced a slight national uptick in violent crime during 2006. Judges, however, were livid over the proposal to limit their power. "This would require one-size-fits-all justice," said U.S. District Judge Paul G. Cassell, chairman of the Criminal Law committee of the Judicial Conference, the judicial branch's policy-making body. "The vast majority of the public would like the judges to make the individualized decisions needed to make these very difficult sentencing decisions," Cassell said. "Judges are the ones who look the defendants in the eyes. They hear from the victims. They hear from the prosecutors." The debate, pitting prosecutors against jurists, has been ongoing since a 2005 Supreme Court ruling that declared the government's two decades-old sentencing guidelines unconstitutional. The ruling in United States v. Booker said judges are not required to abide by the federal guidelines — which set mandatory minimum and maximums on sentences — but could consider them in meting out prison time. The Justice Department wants to return to the old system of mandatory minimum sentences, under which judges could grant leniency only in special cases. Without those required floors, Justice officials maintain that different judges could hand out widely varying penalties for the same crime. Justice officials also point to a growing number of lighter sentences as possible proof that crime is on the rise because criminals are no longer cowed by strict penalties. In the two years since the ruling, federal judges have become three times more likely to hand down prison sentences below the suggested levels, according to 2006 U.S. Sentencing Commission data. In 2005, before the Booker case, those penalties represented 4.3 percent of all sentences imposed. That number rose to 13 percent after the Supreme Court ruling and dipped to 12.1 percent in 2006, the data show. Still, Justice officials privately concede that returning to the sentencing guidelines as required minimums is a long-shot at best. At the least, they say, their proposal marks a first step toward ratcheting back a counter-push by courts to lower penalties for first-time crack cocaine convictions. This week, the Supreme Court waded into the racially sensitive dispute, agreeing to consider whether courts can give defendants similar sentences for crack cocaine crimes as for cocaine powder. Crack crimes usually garner much tougher penalties, and most crack cocaine offenders in federal courts are black. "I don't think they in a million years think it's going to pass anytime soon," said Douglas Berman, an Ohio State University sentencing expert. "But they've gotten more extra mileage out of threatening this, framing the debate of sentencing reform." "Of course this is politics," Berman said. Republicans eager to embrace a tough-on-crime stance as the 2008 election year approaches are demanding that mandatory minimum penalties be put back in place. "Without sentencing guidelines, we are back to unfair sentences and more violent crime," said Rep. Lamar Smith of Texas, top Republican on the House Judiciary Committee. "Congress has a responsibility to ensure tough penalties for violent offenders and restore the basic principle that all people are treated equally under the law." Washington defense attorney Michael Horowitz, a U.S. Sentencing Commission member and a former criminal division official at the Justice Department, said the proposed overhaul will "have some appeal in an election year." But Gonzales, dogged by scandals ranging from fired U.S. attorneys to FBI privacy intrusions, is unlikely to persuade an already skeptical Congress to adopt his plan. "With all the issues in the Judiciary Committee right now, it's going to be tough to get traction on this," Horowitz said. Senate Judiciary Committee Chairman Patrick Leahy, D-Vt., dismissed the plan as misguided. Without Leahy's support, the Justice Department's sentencing plan is unlikely to become law as long as Democrats control the Senate. The Bush administration should be spending more money on local police to battle crime rather than proposing a "large-scale and premature overhaul of our sentencing system," Leahy said.